Froggy's Fiber Followings: Fun Fun Fiber! Yesterday I got my first chance to teach a spinning lesson at my LYS. It was definitely a good experience. I think what worked out better was that the lady who took the class already had all the basic understandings of how to spin. 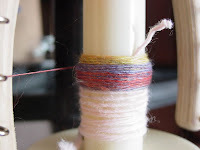 She had purchased her spindle, bought roving and had a really nice starter yarn. She just needed a little clarification as to how to make her joins and why it was thick in some areas and thin in others. These are all basic questions that any beginner would have and sometimes its hard to believe someone when they say "that's the way it is." It's like telling a kid to do something "because I told you so." Of course pay was nominal and went right back towards the fiber that I purchased. I felt very lucky since apparently the owner had just gotten in a big shipment of fiber from Louet and Ashland Bay. I couldn't get the 2 lb Ashland Bay mixes but I did get this sweet 50/50 Soysilk/Wool fiber. There were two different colors but I opted for the brighter of the two. I have really work outside of my comfort zone. If it were up to me I would probably have all the plain muted browns, reds, blues and what not in my yarn containers. I like shaking things up and being different though. I think this is my first official commercially purchased blend. Everything else has been silk, wool, alpaca or my own personal carding experiments. Not that any of that is bad but whoa do I like this stuff. It natural seems to want to spin up thin and twist-y. 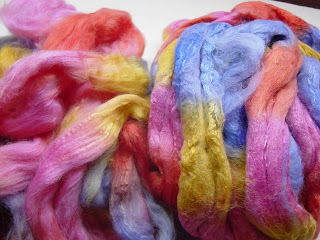 If everything continues well like this, I will probably try my hand at a Navajo ply again. That should thicken the yarn and keep the colors separated. I'm actually a little concern that the drafting is mucking up the colors some so I will probably be working on getting this pre-drafted into smaller slivers of fiber. No matter what happens I'm pretty sure that the resulting yarn will be very, very pretty. I will be anxious to see how this comes along. I have never bought commercial roving and am curious.